After decades of honing their craft, the biologists, technicians and other employees of the DNR's Wildlife Section have the science of wildlife management down to a fine art. South Carolinians remain staunchly adamant about preserving their traditional way of life, and at the very heart of this stubborn determination is a respect - call it a reverence - for the land, which is more than just soil. It's also the wild things, plants and animals that have roots here, and even the silver thread of water that ties it all together. Land is a link to the glories of the past, and more importantly, the hope for tomorrow. As the dust settled after the Civil War and the industrial revolution gave way to the 20th century, the boll weevil dashed the fortunes of many South Carolina farmers, and urbanization began in earnest. First a trickle, then a flood of people left their rural farming communities behind and migrated to towns to work in factories, mills and offices. Slowly, almost imperceptibly, the landscape of South Carolina changed. Few gave it much thought, even as Eastern cougars and ivory-billed woodpeckers became silent across the coastal plain, and white-tailed deer and Eastern wild turkeys vanished from the piedmont and mountains. Fortunately, in the 1930s, visionaries like Aldo Leopold and Herbert Stoddard began laying the foundations for an exciting new science they called wildlife management, and a little more than a decade later, in 1947, Chief A. A. Richardson, head of what was then called the S.C. Game and Fish Department, hired the state's first wildlife biologist, Aiken County native James W. Webb. Within a year, Webb was immersed in a ground-breaking program to relocate wild deer and turkey from the Francis Marion National Forest to the Upstate. 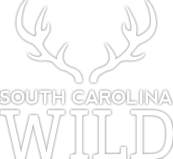 Great things - wild things - were happening in South Carolina, and that work continues today, carried out by the men and women in the S.C. Department of Natural Resources' Wildlife Section. 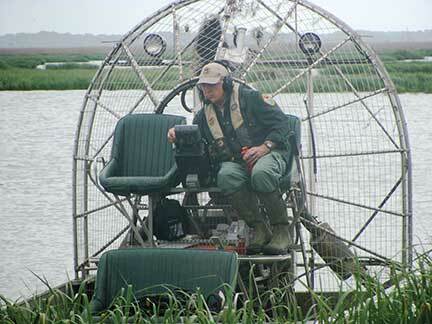 On an overcast Lowcountry morning, S.C. Department of Natural Resources wildlife biologist Dean Harrigal climbs up to the pilot's seat of an airboat, adjusts his head set, tests the rudder and revs up the big propeller. Grass and leaves fly through the air as he maneuvers the craft away from a dike and into a waterfowl impoundment at Bear Island Wildlife Management Area in Colleton County where Harrigal, graduate student Molly Kneece and Nemours Wildlife Foundation intern Kaylee Pollander are surveying mottled duck nests. Harrigal is responsible for overseeing multiple projects at Bear Island, Donnelley and Botany Bay Plantation WMAs - public lands owned by the state of South Carolina and managed for the benefit of its citizens. Bear Island WMA alone encompasses more than 12,000 acres, including 5,000 acres of wetlands with twenty-nine impoundments managed intensively for wintering waterfowl. Waterfowl hunting is important at Bear Island, but mallard ducks are not as abundant as they once were. So, in the 1970s, the DNR began introducing mottled ducks from Louisiana to the South Carolina landscape. Mottled ducks are fairly abundant now on Bear Island, and across the region, adding another large duck to the Lowcountry hunter's bag. Harrigal uses radio transmitters to track some of the big birds through their nesting cycle. "We didn't do much in the way of surveying mottled ducks until about five years ago," Harrigal said. "Right now we are in the middle of a study looking at the nesting ecology and brood survival of the birds, along with habitat utilization. The more we know about the life cycle of any species, the better we can manage them." Bear Island is a premiere public waterfowl hunting destination - each fall, thousands of waterfowl hunters apply for slots in the lottery-drawn hunts held there. But Harrigal will tell you that the majority of people who use the property are actually bird watchers, not hunters. Bear Island's diverse habitats offer outstanding views of many wading birds, shore birds and even song birds and bald eagles in a scenic Lowcountry setting, making it a hugely popular trek for birders and wildlife photographers alike. As the big airboat roars through the impoundment, nesting mottled ducks flush from their dense cover. That's when Kneece and Pollander go to work, wading into the marsh to find the nests, count the eggs or ducklings and possibly band them for future studies. The work is slow and tedious and the conditions wet and muddy. The reward comes from knowing you are managing a resource for future generations to enjoy. Aldo Leopold's 1933 textbook, Game Management, brought attention to wildlife management as a legitimate science, and in 1938, recognizing the need to protect the nation's natural resources, Congress enacted the Federal Aid in Wildlife Restoration Act (also known as the Pittman-Robertson Act), still in place today after more than seventy-five years. The act directs excise taxes paid on guns and ammunition from the federal treasury to individual states to fund wildlife and habitat management activities. To qualify for Pittman-Robertson dollars, states must match the federal funds with the fees collected for hunting licenses and permits. Since the DNR does not charge non-consumptive users to visit, hike or watch birds and other wildlife on WMA lands, the total cost of owning or leasing, and managing, those properties is shouldered by Palmetto State hunters and anglers, a constituency that unfortunately is slowly declining, in part because access to land for hunting has declined. The state's WMA program was created primarily to fill that gap and today offers more than one million acres of land to the public for hunting and other outdoor pursuits. Although some families in South Carolina have held tightly to their land through generations, many others have understood from the beginning that it was only entrusted to them as caretakers for a little while. A few, such as Tom Yawkey and Thomas Samworth, have donated large holdings to the DNR for the benefit of conservation and to keep outdoor traditions alive for future generations of sportsmen and women. "There are two components to the overall Wildlife Management Area program," says DNR Chief of Regional Operations Tim Ivey, "leased acreage and land that we own. The majority of the money collected from WMA permits goes back to the landowners to pay our leases." WMA lands provide excellent hunting, fishing and other outdoor recreation opportunities for the public, and also opportunities for critical wildlife management and research, especially on the DNR-owned properties, which make up about 25 percent of the total acreage in the program. Partnerships with the U.S. Forest Service and the S.C. Forestry Commission account for more than 600,000 acres in the program, adds Ivey. "Although we utilize WMA lands to provide hunting opportunities," he says, "we try to manage the habitats for wildlife diversity for all species - both game and nongame." 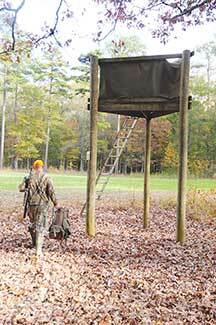 As the user base of hunters continues to shrink, funding from hunting and fishing license sales and Pittman-Robertson dollars dwindles too. However, the numbers of non-hunters using WMA lands continues to increase, so the cost of managing these properties doesn't go down. Taking care of WMAs is expensive. It's not just the cost of leases; the additional costs and manpower involved in providing even the most basic public access and recreation opportunities are considerable. "When you consider all that maintaining these properties entails," Ivey says, "what we do is very significant even before we begin to do any research or restoration for a particular species." To learn more about the properties and wide variety of recreational opportunities available through the WMA program, visit the DNR website (www.dnr.sc.gov) and click on the "Public Lands" tab. Just an hour up the road from Bear Island, Christy Hand is monitoring endangered wood stork nests at Dungannon Heritage Preserve. Hand, a wildlife biologist who specializes in wading birds, enjoys field work, even though it means exposure to swarms of biting insects that inhabit the same areas where the wood storks nest. 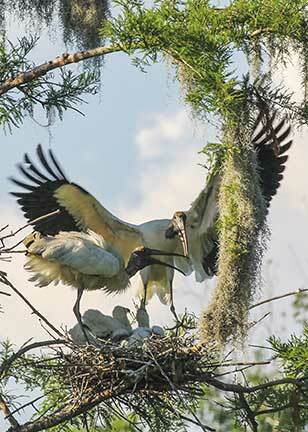 Nest monitoring is one technique used to assess the status of wood stork populations, along with statewide surveys conducted to determine the number of stork nests built. Nesting activity in several colonies is recorded in order to determine if the storks are raising enough fledglings to meet the recovery goals for this federally-endangered species. 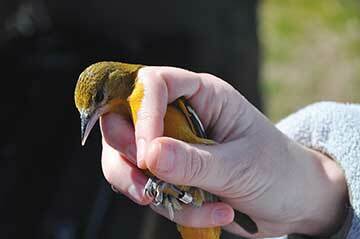 Satellite telemetry and banding studies also help biologists better manage the bird's habitat. "We map the nests that are in good view all during the season," Hand says. "Then, each week I go out to determine the status of every nest. I need to note if nesting attempts have failed, if birds are incubating or if chicks have hatched. After the hatch, I record the age and number of chicks in each nest. Chicks that survive to at least eight weeks are counted as fledglings." Because wood storks can be sensitive to human disturbance, Hand has to enter the nesting area carefully, moving slowly with her spotting scope across her shoulder. Once she is in position, she can look at each nest and make the appropriate notes. It may seem a low-tech approach, but there is no good substitute for boots on the ground to collect this kind of data, explains Hand. "The goal of the nest monitoring project is to estimate the number of chicks that fledge per nesting attempt at several stork colonies throughout the state," she says. "This information is used by the USFWS to help determine whether or not the wood stork should continue on the endangered species list." 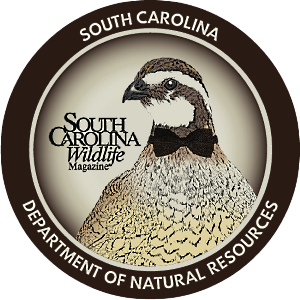 For many decades, bobwhite quail, not white-tailed deer, were the most popular target for any self-respecting South Carolinian calling him or herself a hunter. And for those who specifically called themselves bird hunters, well, no other descriptors were necessary - "birds" equaled quail. But change is inevitable and change is exactly what happened to "Mr. Bob" and his bevy. More accurately, land use patterns and habitats changed. In the early days of wildlife management, Herbert Stoddard demonstrated that quail, like many species, are an annual crop. If enough suitable land is managed properly, over time, bobwhites will fill the space provided for them. Biologists once thought bobwhites were habitat generalists, but it turns out that their habitat needs are very specific - and that habitat is in serious decline. The patchwork of small farms that once defined South Carolina's rural identity has faded, replaced by fast-growing stands of loblolly and slash pine and urban neighborhoods. As the undeveloped countryside shrinks, the habitat that made the bobwhite a welcome by-product of the land has disappeared, but for those who can't imagine a Palmetto State without partridges, there is still hope. DNR Assistant Chief of Wildlife Billy Dukes spent a large part of his career as the state's Small Game project coordinator, and in that role led yearly quail management seminars aimed at educating landowners in the proper techniques for increasing bobwhite quail on their property. Despite management programs on state-owned properties, most game and nongame species depend heavily on properly managed private land, explains Dukes, because more than 93 percent of land in South Carolina is in private hands. But as Dukes also points out, public lands do serve important functions, providing recreational opportunities for a variety of user groups, preserving rare species and habitats and serving as demonstration areas for wildlife-friendly land management practices. By incorporating the principles of ecosystem restoration, the DNR manages many of its properties to benefit a variety of species simultaneously. A prime example of this type of ecosystem management is on display at the Webb Wildlife Center in Hampton County, where DNR biologists and technicians use proven strategies like selective timber harvesting, prescribed burning and fallow field management to improve quail populations. These techniques also benefit grassland songbirds, pollinator species, endangered red-cockaded woodpeckers, reptiles and amphibians, and popular game species such as deer and turkey. Although the average landowner or hunter may tend to think of simply planting food plots as habitat management, food is just one component of quality habitat for any wildlife species. The quail seminars at Webb try to take landowners beyond that to see the bigger picture that is landscape habitat management, teaching them the importance of creating and maintaining brood habitat, feeding areas and escape cover over as many acres as possible to maximize benefits for wildlife. At the Webb Center, wildlife technicians Ted Rainwater and Nathaniel Holmes are involved in that type of activity on a daily basis. Depending on the season, visitors may find them planting food plots, implementing prescribed burns or assisting hunters on the many draw hunt opportunities available at Webb. "I feel like we have a great team working on this property," says Holmes, whose father also worked as a technician at the Webb Center. Rainwater agrees, and says their work is easier because everyone seems to be committed to a common goal - keeping the habitat wildlife friendly. 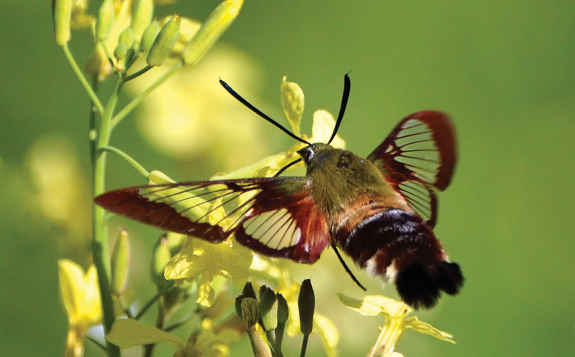 While habitat management is the main focus for many species, for others, such as furbearers, it is not as critical, according to DNR biologist Jay Butfiloski, who supervises the agency's Furbearer project. Furbearers, animals that historically were hunted or trapped for their fur, are habitat generalists, except for a few that depend on water. Many have adapted readily to the habitat changes that have plagued other species. In South Carolina, furbearers include beaver, bobcat, coyote, fox, mink, muskrat, opossum, otter, raccoon, skunk and weasel. "Coyotes and beavers seem to get the most attention these days, because they affect more people negatively," Butfiloski says. "And it can be a challenge to convey to the public that a species has ecological value when that same species is causing economic damage to a number of South Carolina residents." For deer hunters, coyotes are public enemy number one these days. Research at the Savannah River Site has shown that coyotes can be significant predators, negatively affecting white-tailed deer fawn recruitment. Hunters kill an estimated 30,000 coyotes per year in South Carolina, but that has had little impact on their steadily increasing numbers. The DNR hopes that new measures now in place that allow night hunting of coyotes, as well as the issuing of free predator management permits outside of trapping season, will help. The state's white-tailed deer population began to increase following habitat changes to our state's agricultural landscape following the Great Depression and the decimation of cotton by the boll weevil. As South Carolinians left the farms for jobs in urban settings, thousands of acres of agricultural fields were left fallow for decades allowing natural ecological succession. What was once a predominately agricultural landscape became a forested landscape, and the statewide deer population expanded, peaking at an estimated one million animals in the late 1990s, according to Charles Ruth, the wildlife biologist who coordinates the DNR's Deer and Wild Turkey projects. 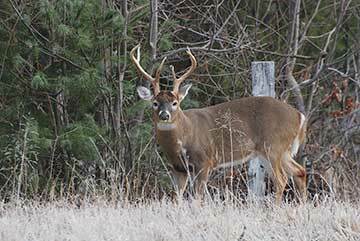 Today, the population is estimated at approximately 750,000, down by approximately 25 percent; however, whitetails remain abundant and healthy in all areas of the state. "For many years, deer have been the high profile species in South Carolina," says Ruth, "followed by turkeys and waterfowl. Clearly most of our licensees deer hunt." Ruth explains that although we have a great resource in our deer population, many well-meaning laws, still in effect, were put in place before there was a wildlife agency in the state. Unfortunately those laws, although antiquated, are hard to change in a state as steeped in tradition as South Carolina. While change comes hard, most hunters today believe it is in the best interests of the deer herd to consider changes that better suit modern management practices. "Whether the changes we are seeing in our deer population are related to habitat, ongoing harvests or coyotes is not overly important," says Ruth. "What is important is that we recognize that things are, in fact, changing and that we need to adapt our management strategies for the future." Some folks consider the Lowcountry the birthplace of the traditions that define our state, but from those early South Carolinians who dared to look to the west, new stories and traditions also arose in the region where the Blue Ridge Mountains reach toward the Palmetto State sunset. Wildlife biologist Mark Hall, property manager of the DNR's Jim Timmerman Natural Resources Area at Jocassee Gorges, would not hesitate to tell you that he works on the most beautiful public property in the state, and many visitors to the area would agree. Although Lowcountry stories take up quite a few pages in history books, the Upstate's diverse plant communities and unique habitats tell the story of a place that also exudes history and beauty. The Jocassee Gorges property was once heavily logged, and today Hall and his staff are using prescribed fire to help return the ecosystem there to its pre-logged state. "Much of our focus," says Hall, "is the restoration of Table Mountain pitch and shortleaf pine, and oak-hickory plant communities on the upland slopes. Fire is the best tool for eliminating off-site species such as yellow poplar, red maple, rhododendron and mountain laurel." The Jocassee Gorges provides visitors with breathtaking views in all seasons, from mountain vistas to vibrant fall leaves and dramatic waterfalls. For those who look closer, many unique and sometimes rare plant communities call this mountain wilderness home. Much of the management work at Jocassee is done to restore these plant communities and, of course, to provide public recreation opportunities such as hiking, fishing, wildlife watching and hunting. One of the great success stories associated with this property is the discovery of South Carolina's second known pair of nesting peregrine falcons in 2008. Every year since then, at least two new peregrine falcons have fledged at this site, contributing to the species conservation and expansion. But many challenges remain. For instance, large numbers of the native hemlock trees in the gorges have been lost to an invasive pest, the hemlock woolly adelgid. "We have developed a hemlock management plan," Hall says. "And now the rare Carolina hemlock, as well as select stands of Eastern hemlock, are being protected with the careful use of an insecticide." Because this is a very large property, approximately 32,000 acres, it provides recreational opportunities that smaller properties cannot, especially the solitude that is characteristic of remote wild places. 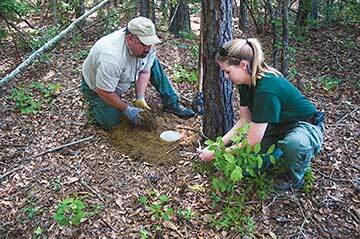 Also in the Upstate, biologists Tammy Wactor and Richard Morton research and monitor black bear populations. "Black bears have historically ranged throughout the mountain region of South Carolina," Wactor says. "And, for the past decade or so, the population has been expanding." As more development comes to the Upstate, the habitat the bears call home declines a little each year, often bringing bears into contact with people. More than 350 bear complaints are logged by DNR staff in the Upstate each year now, and black bear harvests have nearly doubled since the last population estimate was made in the 1990s, according to Morton. "Right now we are implementing a DNA study using hair snares," Morton says. 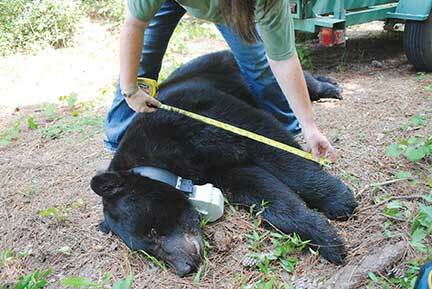 "This will give us a much more accurate estimate of the bear population in the Upstate." While hunting is an important management tool to keep the Upstate bear population in check, Wactor says education is the key to future bear management. From the mountains to the sea. These are six words SCW readers will be familiar with, but probably not in this context. That's right, we're still talking about black bears. 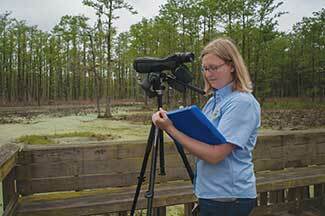 DNR wildlife biologist Deanna Ruth works in Horry County, not far from the summer tourist mecca of the Grand Strand, managing a rapidly expanding black bear population on the state's coastal plain. Ruth and her staff have been using DNA technology to survey the population, and now they use specially made traps to capture and fit bears with GPS tracking collars to determine the extent of the bears' home ranges. "In 2006, we had about twenty black bear calls," Ruth says. "In 2007, we had 188. That's when we started rethinking what we thought we knew about coastal black bears." Ruth explains that although the Upstate has many more bears than the Lowcountry, the coastal bears are much more concentrated. In fact, black bears are on the move statewide, with confirmed sightings in forty-five of South Carolina's forty-six counties, Ruth says. And that presents another challenge. As the bears continue to travel along river basins and water drainages, they are probably setting up other new home ranges. Lexington and Richland county bear calls are already on the rise. Derrell Shipes, the DNR's chief of state-wide projects, explains that funding continues to be a challenge, one that he and his colleagues take very seriously. "In the world of game animals," Shipes says, "we have had good funding mechanisms through Pittman-Robertson and other legislation. But in the world of nongame and endangered species, we have never really had the stable funding mechanisms we needed. We've been relying on crossover, and fortunately, when we manage for game it is almost never negative for nongame species." Shipes' concern is echoed throughout the DNR, and especially in the Wildlife Section, as the hunter constituency continues to shrink, along with critical funding dollars. Emily Cope, the deputy director of the DNR's Wildlife and Freshwater Fisheries Division, knows about change, too. She has to balance changing habitats, changing species populations, changing public expectations and changing politics, often including shrinking budgets, but that is the job she has and she is fearless about moving forward each day without becoming overwhelmed by the challenges tomorrow may bring. "Our objectives have changed considerably," Cope says, "but what we have seen over time is how dire situations have become wonderful success stories for wildlife and for South Carolinians. I am convinced that we can continue to provide more successes as we meet our challenges head-on. Regardless of what we have to face, we are doing good stuff for wildlife in South Carolina." While some of the properties in the DNR's Wildlife Management Area program are open to the public on a "first come-first serve" basis, in order to protect other critical resources from overuse and offer better quality hunting opportunities, the DNR devised a lottery hunt program in the 1980s. Lottery-drawn hunts on selected WMA properties are currently available for deer, quail, doves, waterfowl, turkey and alligator. Patty Castine, the DNR's administrative coordinator in charge of the lottery hunt program, has been keying in the applications for these hunts by hand for thirteen years. Finally, with the 2013 season at hand, she'll get some welcome relief. "This year we are implementing a new online system," Castine says, "which will give applicants an option to apply online and use a credit or debit card to pay their fees." The new system will be less labor intensive for Castine and more convenient for the hunters. Applicants will continue to accumulate preference points for each drawing they enter, guaranteeing their eventual selection for hunts they enter year after year. 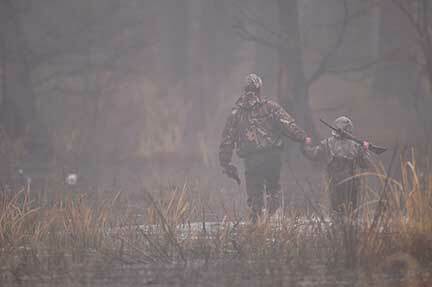 And for now, hunters can still apply with a paper application by mail or at any of the DNR's regional offices. Botany Bay Plantation WMA and Heritage Preserve on Edisto Island, 4,687 acres of wildlife heaven, is the DNR's most visited property, averaging about 48,000 visitors per year, according to wildlife biologist Sam Chappelear, the coordinator for DNR's Region 4 management programs. "The beach gets a lot of attention," Chappelear says, "but it's the uniqueness of the entire property that draws so many visitors here. 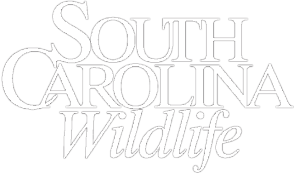 The success of this project is a direct result of the Wildlife and Freshwater Fisheries Division and the Marine Resources Division working together to provide a unique experience for South Carolinians." Many visitors do come for the beach, it's true, but others come for the walking trails or to see the site of Bleak Hall plantation or the ruins of Sea Cloud plantation. 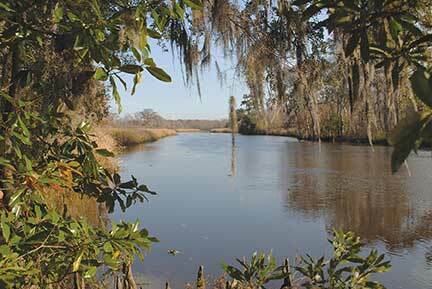 Visitors can also launch canoes to paddle in tidal creeks or fish in the surf. Freshwater fishing (for youth only) is available in Jason's Lake. 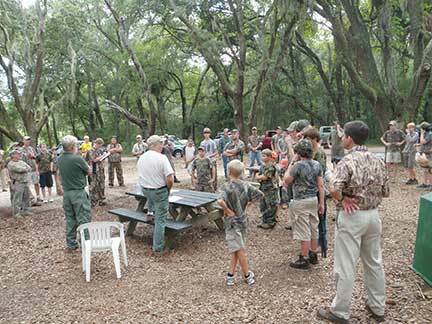 Still others come for the youth dove hunts or the white-tailed deer hunts. The focus at Botany Bay is on the management of wildlife habitats. The challenge is meeting that goal while still providing great recreational opportunities for the public. 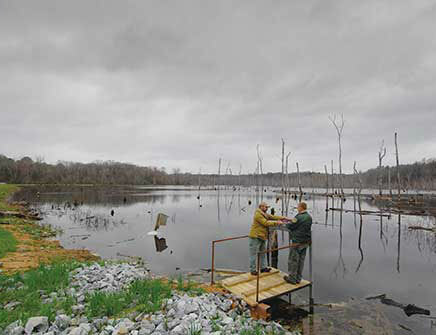 DNR technician Bruce Rawl, who worked as caretaker at Botany Bay Plantation for the former owner, gives this high-traffic property some much needed continuity, especially when it comes to management of the wildlife habitat and hunting opportunities. He is assisted by approximately one hundred volunteers - local residents who spend as many as 7,000 cumulative volunteer-hours per year greeting visitors, answering questions and taking care of any other needs that may arise. These volunteers, led by Bess Kellett, also help with wildlife management activities, such as marking nesting sites used by sea turtles and least terns. "We couldn't manage this place and offer the public so much access without our volunteers," Chappelear says. 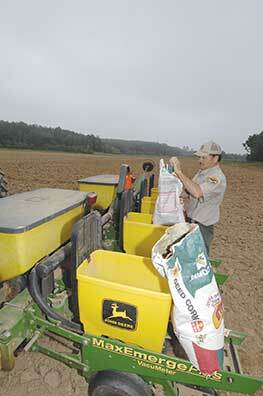 DNR staffers take advantage of technology when they can, but often the job still calls for a low-tech approach. Bird banding is one of those tasks, and biologists use walk-in traps and various types of nets to capture birds for banding without harming them. Once the data from captured birds are collected and recorded, then the technology kicks in - sophisticated computer models can help biologists estimate life spans, population dynamics and other valuable information. Besides just attaching the band to a bird's leg, technicians and biologists measure and weigh each specimen and sometime even take blood or DNA samples to determine the relative health of an individual or a species. "The majority of the public thinks we only get data on bird movement from banding," says Billy Dukes, the DNR's assistant chief of wildlife. "But most of that information is already well established. We know where our ducks and doves come from and where they are going when they leave. The really important data we get from bird banding is information about survival and mortality. All of this information is very important, especially when you are developing national or regional harvest management strategies or making recommendations for annual hunting regulations for game birds." As much as South Carolinians treasure their home state, they have not been quite so careful about protecting its landscape. For better or for worse, urbanization, growth and development have changed the face of South Carolina. With the march of progress came the following: vast savannas of longleaf pine harvested; mighty old-growth cypress swamps logged; rivers dammed to deliver electrical power; towns and cities built where native plants and animals once held dominion. Perhaps now the time has come for fire and flood to heal habitats and ecosystems that have suffered as a result. It's not quite so Biblical as it sounds, but any land manager worth his or her pillar of salt will tell you that a little inundation and conflagration can be a good thing, when properly used. Greg Lynch, wildlife biologist and project leader for the DNR's Upper Coastal Waterfowl project, which includes Samworth, Santee Delta and Santee Coastal Reserve WMAs, moves water to create habitat for many species of waterfowl, wading birds, raptors and more than a few alligators. To accomplish this task, Lynch uses tools first established in the Lowcountry during colonial times. "We have more than a hundred miles of dikes and a hundred or so water-control structures on our project," Lynch says. "So there is always something that needs to be done. The work is hard and often cold and wet, but this group of guys pulls together and the job gets done." Lynch and his team of technicians build, repair and replace rice trunks in the dikes, structures brought here to move water for agriculture. Early rice planters used them, along with a series of hand dug canals, to move water to grow a crop. 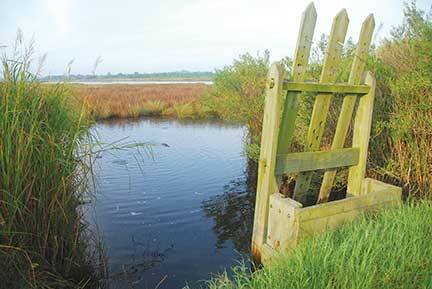 Today, Lynch uses the same technology to create habitat for waterfowl, wading birds and shore birds. But there is more to it than merely raising and lowering water levels - much more. Technicians, including Gilbert Allen, have learned to very subtly mold the environment in time with the heartbeat of the water birds that pass through this wet and wild habitat. And at the same time, just as a byproduct, they help to create breath-taking landscapes that can only exist in coastal regions. DNR land manager Johnny Stowe likes to turn up the heat on some of the properties in his charge. 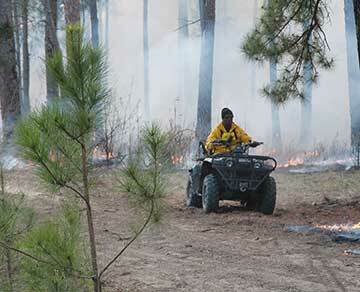 Stowe, an expert on prescribed fire, knows that smoke in the piney woods does not have to be destructive. In fact, prescribed fire - also called controlled burning - is necessary to recreate the longleaf pine habitats that once dominated more than ninety million acres across the Southeast, creating park-like vistas where bobwhite quail, red-cockaded woodpeckers and even diamondback rattlesnakes once thrived. Although this natural habitat was degraded or destroyed - not by fire, but by fire suppression, unsustainable logging and agriculture - with foresters like Stowe leading the way, this native habitat continues to return throughout South Carolina. Joey Frazier is editorial assistant for South Carolina Wildlife magazine. He also loves to hunt in the woods of South Carolina.